Taken from the brochure "Post Civil War Buildings and Sites of Interest Historic Tour of Edwardsville" published by the Edwardsville Economic Development Commission & Edwardsville Historic Preservation Commission. The Civil War was fought during four bitter years of bloodshed from 1861-1865. Edwardsville survived any direct battle conflict during the four years. After the war and during the next 75 years, Edwardsville continued to grow with a tremendous surge of construction, spawning an array of architectural styles and a citizenry who helped shape the 20th Century in the region, the state, and the nation. By 1866, the population of Edwardsville had reached 2,000 and had a courthouse in the square where the present structure, built in 1915, is located. The town boasted three flour mills, two breweries, a distillery, a steam furniture factory, and several carriage, wagon, plow, and mechanical shops. There were two coal mines in the north part of town that served the needs of local citizens. The Edwardsville Intelligencer was founded in 1862, the telegraph arrived in 1868, the telephone by 1882, and business was on the upswing. The Edwardsville Dry Goods Store, also known as the Mammoth Cheap Store, at Main and Purcell, was opened in 1864 by George Crane and operated by him until he retired in 1895. In 1870, Edwardsville's Main Street ended abruptly in a drop-off at the northwest end, in front of the Klingle Home, which is still standing at Main and Phillepena. Main Street was "paved" in those days with heavy wooden planks a foot wide and laid crosswise. Also, by that time, most of the old log cabins had disappeared or had been covered with weatherboard, and new brick or frames homes were being constructed. And, it was nothing to see livestock roaming free on the streets of town. Many families had a cow and most had at least one horse. Also by 1870, Edwardsville had begun to move uptown. The post office was a small building just north of the courthouse. It was moved to Hillsboro Avenue two blocks away, in 1917. The county jail was just east of the courthouse. Children were attending Dale School on Kansas Street, between High and College, where the site later became Edwardsville High School and, eventually, today's Columbus School. By 1887, the city had three schools, with 12 teachers and 950 students. The old Lincoln School, located in the older part of town and now housing various shops, became a school for black children In 1879. In those days, St. Louis Street was know as Fair Grounds Road and boasted only a dozen homes or less. It wended from the courthouse to the Madison County Fair Grounds, where Woodlawn Gardens is now located. The stagecoach road from Springfield crossed west of Fourth Street and merged with the road, which beyond the Fair Grounds connected at had at the old Ebenezer settlement and became St. Louis Road on its way to the city of the same name. In 1887 the population had reached 3,300 and Edwardsville, which by that time had been incorporated as a city, had a new mayor - Charles Boeschenstein, who later would help establish a permanent library building, now standing in Edwardsville City Park. The outgoing mayor, Alonzo Keller, according to an edition of the Missouri Republican newspaper in 1887, announced that no city tax had been levied for five years, the city was not in debt, there was $6,000 in the city treasury, and that Edwardsville "had the finest sidewalks in America." The sidewalks were, of course, made of wood planks. The railroad had become firmly entrenched in Edwardsville by 1887, with two truck lines - the Wabash and the Toledo, St. Louis and Kansas City (known as the Clover Leaf) - and a branch line connecting three rail lines. Two express companies, the Pacific and American, afforded speedy transportation, and two telegraph companies, the Western Union and the Postal, were in existence. Eventually, the McKinley System provided electric trolley transportation within Edwardsville, and to Granite City, Madison, Venice, and St. Louis, as well as to Springfield, Peoria, Champaign, and Bloomington. Other sites that could be seen in 1887 Edwardsville were: the St. James Hotel, constructed in 1875 by Hugh McKittrick on what is now a municipal parking lot next to Edwardsville Frozen Foods (the building burned in 1932); the adjacent Tuxhorn Opera House, a building still standing just south of the municipal lot; two banks - J.A. Prickett & Sons and West & Prickett- and the Edwardsville Building Association, all serving citizens' financial needs; during harvest season, on any given day on Main Street a string of wagons "a mile long" bearing grain to market; four brickyards, as well as a buggy manufacturing company, a sugar refinery, and a creamery, just to name a few. The Edwardsville Power and Light Company was organized in 1892 and a power plant was constructed on Second Street. In October of that year, 25 street lamps were installed, each with 2,000 candlepower. The first move to obtain a city water system was made in 1891 when a Chicago consultant was called in to study the situation. In 1984, the City Council passed an ordinance allowing a water system to be constructed. 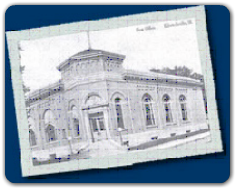 After several moves, the present Edwardsville Library was constructed in 1905 through a $12,000 donation from the Carnegie Foundation. A north wing was added in 1964 and, in 1990, extensive construction doubled the size of the building. Among the prominent men of Edwardsville at that time were bankers and physicians, such as bankers Edward and William Prickett and John and Harris Prickett; physicians E.W. Fiegenbaum, and Joseph Pogue, who had served as a regimental surgeon during the Civil War. These were just a few of the civic leaders who, along with their predecessors, led Edwardsville from a small settlement in the Land of Goshen to a thriving city in the heartland of America.